John and Brenda could not have been anymore helpful on our special day. They were extremely friendly and professional with very timely responses. John was a breath of fresh air and made us feel very comfortable during the ceremony. During the original consultation we all got to know one another before hand which made things flow very smoothly. We specifically wanted a celtic hand tying ceremony and they fulfilled this perfectly. I could not recommend them anymore as people and as professionals! Knew when left she was who we wanted. Brenda is exactly what we were looking for and am so excited for our wedding day. She makes a point to get to know you so she can personalize your ceremony. We absolutely loved working with Brenda! She is the sweetest soul! 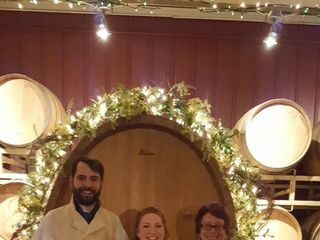 We are still getting compliments about our beautiful and unique ceremony! Thank you, Crystal! I hope you two have a lifetime of wedded bliss with many happy moments! It was truly a pleasure working with you in the creation of your ceremony, I always enjoy when couples take an active role in making their vision come to life. Beautiful Ceremony. Meaningful message. Very personal. Custom tailored to fit the couple - definitely not cookie cutter. Perfect! Brenda was absolutely amazing! She is the sweetest and worked with us to create the perfect ceremony. I had some many people after the ceremony telling me how wonderful it was because it was so personalized and filled with love and I couldn't agree more! She made everything so simple for us and walked us through everything we needed to make sure we had all our paperwork in order. You can tell how much work and love she puts in all she does. She even created a beautiful certificate for us to display! I am so happy we choose to work with Brenda, she is simply fabulous. Thank you so much, Natalie! I’m so delighted that I had the honor of being your officiant. I wish for you & Jake all the happiness in the universe! Brenda was phenomenal. We booked her services at the last minute (one week out!) and she was immediately responsive and entirely willing to work with us to craft our perfect wedding ceremony. Her upbeat spirit and innate supportive nature meant the world to us. Before the big day, we spoke via Skype to get to know one another better and it was incredibly comfortable. We cannot say enough good things about Brenda and the way she elevated the celebration of our marriage. She even provided us with a hard copy of our ceremony script as a keepsake of our wonderful day. Thank you so very much for your kind words. It was truly a pleasure and I'm just delighted I was able to step in share your day! Much love to you both! I highly recommend Sacred Celebrations. Brenda Barry officiated our ceremony and from the very first Skype call, Brenda was a pleasure to work with. She is professional and very personable. My husband and I appreciated that the creation of our ceremony was a collaborative effort, which made it unique to us. We received lots of compliments on the ceremony and the officiant. The overall experience was A+. Brenda officiated our ceremony. She was easy to work with and we knew we were in good hands the moment we started to work with her. She gave us the type of ceremony we were looking for and truly made it magical! So many people commented after that while it was a traditional ceremony, Brenda made it about us and added the right touches to make it special and unique. It was an amazing day! Brenda and John did a great job as our officiant. 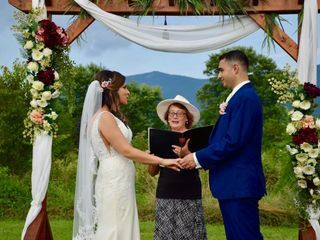 Brenda customized the beautiful ceremony draft for us based on our own experiences and personalities, while John’s elegant experiences and quick reaction at our ceremony made it just perfect. They carefully listened to and adopted our thoughts and opinion, and attended the ceremony and rehearsal in advance to make sure that everything goes as planned on time. We feel so lucky to have picked Sacred Celebrations for our ceremony. It was indeed our pleasure to be part of your celebration. May your life together be filled with happiness and delight! Brenda was amazing to work with! She's very kind and compassionate. Our ceremony was absolutely beautiful and we received several compliments from family. Brenda made our ceremony one to remember. Highly recommend! Brenda was amazing. She wrote a beautiful ceremony, with almost no help from us, and yet managed to tailor it so specifically to our needs and desires. I'm telling everyone about her! Thank you so much for being part of our day, you were the highlight of our event!! Thank you for being so great and we loved having you there!! The only thing I would change about that day is to remember to invite you to stay for the dinner. I was very busy and I wish I had asked you to stay around. But other than that you were great and all guest were talking about your talk!! I also loved your hat that day, which gave our day a character!! Ms. Brenda was fantastic. She uniquely designed a hand-fasting ceremony for my husband & I. Her personality is magnetic and her energy is a breath of fresh air. So easy to speak, work, attentive and responsive. We LOVE her! Thank you so very much Crystal! I truly appreciate your kind words and want you to know how much I enjoyed working with you and Joey! A lifetime of happiness to you both! Our wedding ceremony was so beautiful. We loved our knot tying ceremony and how well it was done by John. We would strongly recommend this impressive husband and wife duo for your ceremony. Thank you so much! We couldn't have been more pleased with our wedding. The vows read by Brenda were just beautiful and really in line with what we were looking for. It was very special. 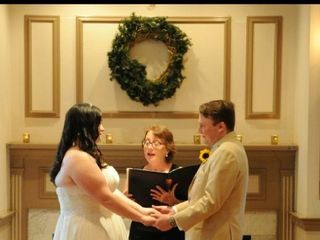 Brenda was an ABSOLUTELY AMAZING officiant for our wedding. She was the first person we interviewed and we didn't even bother meeting with other potential officiants because she was so personable. She responded to every question super fast and made sure the ceremony was exactly as we wanted. All our friends and family assumed we had known her for years because of how personalized her talking points were in our ceremony. Brenda provided the most lovely ceremony for us. It was exactly what we wanted. She conducted herself very professionally and is a wonderful provider. Cudos to her. Thank you ,thank you, thank you making our day complete. Brenda was such a pleasure to meet. She performed a lovely, personalized ceremony for us. She was flexible with our schedules and always promptly responsive to emails and phone calls. Would highly recommend her! Brenda was fantastic! Knowledgeable and warm, I loved her attitude. Perfect. Excellent. She made our ceremony! Her kindness and calm voice and beautiful spirit made our ceremony such a special and blessed one! So thankful we found her !!! One of the best decisions we made for our wedding!! Brenda crafted a ceremony to meet our specific needs (Christian and Wiccan). She is beyond amazing, kind, generous...a truly special lady! Brenda is a radiant and loving person that you just want to be around. She officiated our Celtic Hand fasting and it was the most beautiful ceremony, my husband and I were truly moved. We highly recommend Brenda to any couple seeking out a unique ceremony. She is very flexible and you will be a part of the process of creating the ceremony, start to finish. We are both so pleased with Sacred Celebrations and Brenda. Thank you! Becky is an absolute joy to work with. 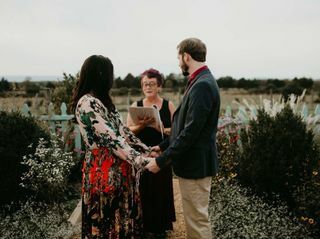 Not only is she knowledgeable about a plethora of different ceremony traditions and conventions, she is passionate about her work, weddings and love, and it shows! I am so glad we booked with her. 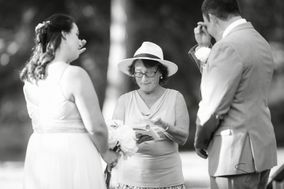 Brenda served as the officiant for our wedding and did an amazing job. She worked with us to understand exactly the kind of ceremony we were looking for and gave us lots of options to customize our day. Her questionairre allowed her to incorporate our personalities into the ceremony and gave everything a personal touch. Also she had purple hair for the day of our wedding and it was amazing! I’d recommend Brenda to anyone looking for a unique but professional experience! You & Thomas have something special! It was a joy to celebrate your wedding! May you have a lifetime of happiness! My wife and I were truly blessed to have Brenda perform our 20th Anniversary vow renewal. Brenda was able to take a few answers from a questionnaire and put together a beautiful statement that reaffirmed our love for one another. Thank you helping us celebrate our special day.